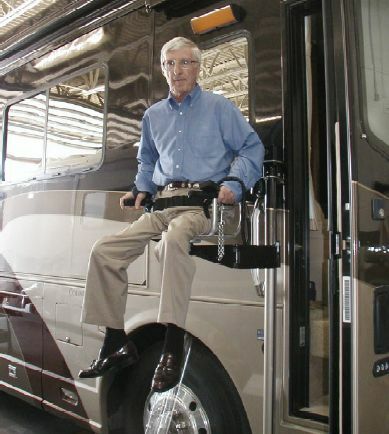 DW Auto and Home Mobility has been modifying RV's for wheelchair access for over 15 years. 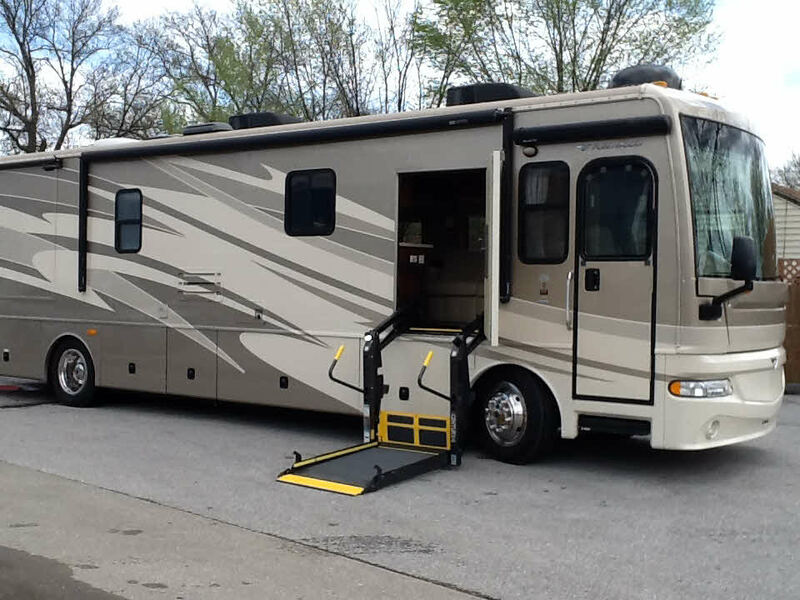 Each RV conversion is made custom to fit the needs of the RV and the client. A full conversion consists of making a door, an automatic entry ( a door opener and remote), a lift (operated by the remote), and finishing the paint and interior to match. For budgets we can pair it down a little and remove the remote entry. This would just make it a manual entry. When the door is fully closed you cant even tell that it wasn't made originally that way. Full conversions start at $19,000.00 and go up to $23,900.00. Conversion prices are subject to specific RV's and can very depending on complexity of the project including paint. Project times are roughly 4 weeks for production. Lead times for projects is about 2 weeks. 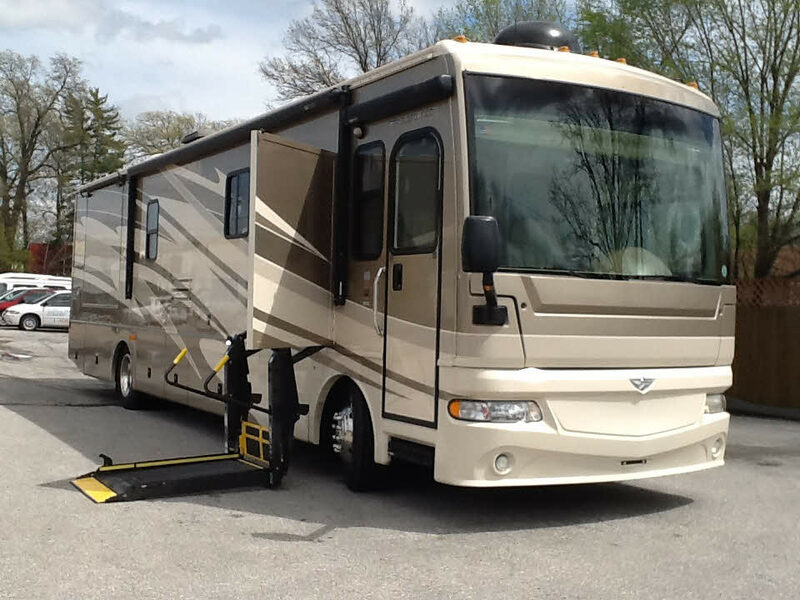 We can work with your RV dealer if you want to finance the project into the cost of your RV. 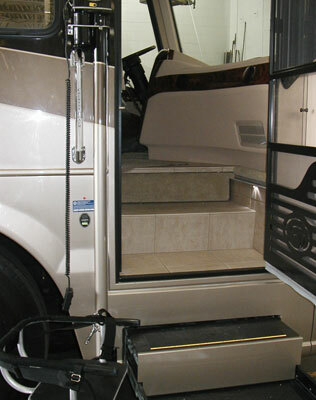 RV Handicapped Lift is a person lift designed for durability and ease of use. It eliminates the need for widening or modifying the RV entry door. It can be installed on the exterior of the RV, adjacent to the entry door, or inside the door mounted in the step-well of the RV. The user sits in the lift chair, pushes the hand-held control button, then rises gently on the vertical lift tube. The chair swings through the door opening into the interior of the RV, bringing the user to the living floor of the vehicle. The double-hinged design of the swing arm allows the durable aluminum chair to turn to any angle for easy loading. Customization is a regular part of our business, because we know each individual’s situation is unique.